Drugs continue to be dealt by certain rickshaw drivers in Dublin despite significant work undertaken by gardaí in the past 18 months to combat the problem. Last night's RTÉ Prime Time programme broadcast secretly filmed footage where it took less than four minutes for undercover reporters to complete a purchase of drugs from a rickshaw driver at the junction of Grafton Street and Stephen’s Green in the city centre last Friday night. The footage was filmed two weeks after an operation by gardaí targeting drug dealing rickshaw drivers in Dublin. Figures released by gardaí show that in the last 18 months almost 150 arrests have been made of rickshaw drivers suspected of dealing drugs in Dublin. Among that figure are a number of individuals who have been arrested multiple times. In the Prime Time footage, a rickshaw driver is heard describing how it would cost €10 for "a pill" and €100 for "a gram of cocaine". The items purchased by Prime Time, including what the dealer said was a gram of cocaine, have since been destroyed. Rickshaws are unregulated in Dublin. Minister for Transport Shane Ross is considering a report from the National Transport Authority about whether to regulate the industry. Detective Superintendent Peter O’Boyle told Prime Time that many rickshaw drivers had no involvement in criminality, but since 2016 gardaí had detected an ongoing problem with a number of rickshaw drivers dealing drugs such as cocaine and ecstasy. As well as carrying out 147 arrests, gardaí have seized significant amounts of drugs in follow up searches of properties around the city. 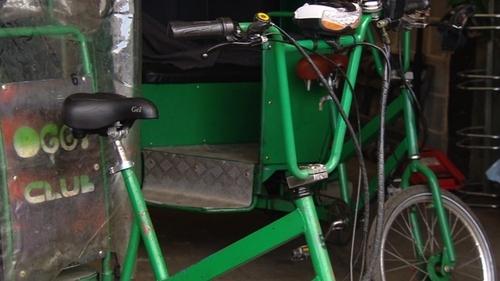 Most of the rickshaw drivers arrested are Brazilian, but detectives say a number of Irish criminals are supplying drug dealing rickshaw drivers.